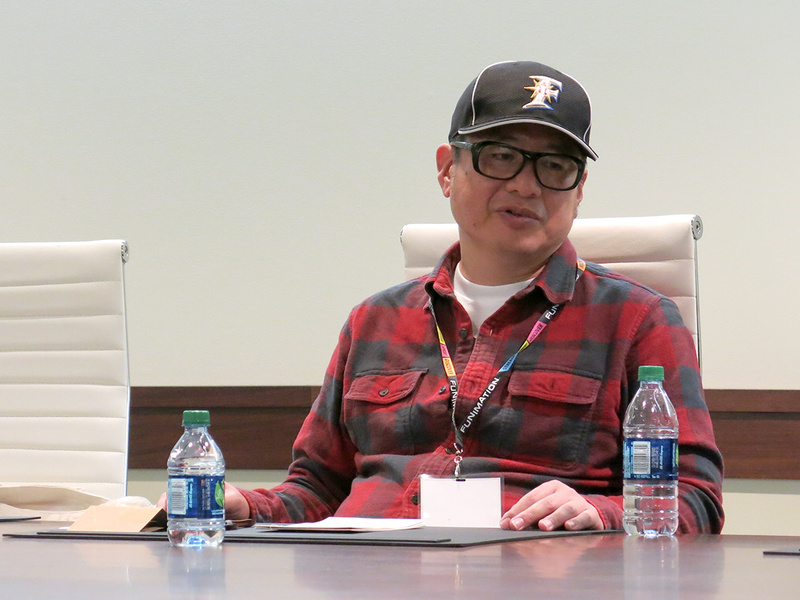 Japan-a-Radio was given the privilege of participating in a round-table press interview with animator and character designer Takahiro Yoshimatsu (吉松孝博) at Sakura-Con 2016. He is best known for his work on Cyber Formula GPX (新世紀GPXサイバーフォーミュラ) and Juubei-chan (十兵衛ちゃん) as both character designer and animation director. In the west, he is perhaps better known for his character designs for TRIGUN in 1998. He drew the illustration on the official Berryz Koubou shirt he's wearing. 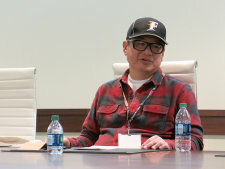 Mr. Yoshimatsu entered the Japanese anime industry after completing high school, joining Studio Live (スタジオ・ライブ) animator and founder Toyoo Ashida (芦田豊雄) where he still works today. He originally aspired to be a manga artist, and continues to draw under the pen name Something Yoshimatsu (サムシング吉松). Outside of animation, some of his other passions are the Japanese idol organization Hello! Project, WWE professional wrestling, and KISS. Both have led him to travel around the world, following former Hello! Project group Berryz Koubou (Berryz工房) around Southeast Asia, and travelling to North America regularly for to see WWE and KISS. 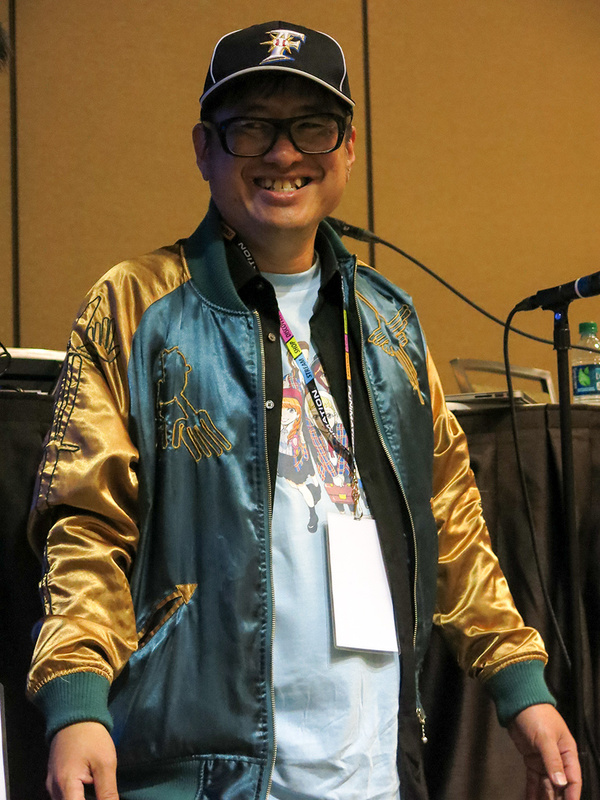 His love for Berryz stood out in particular; in addition to his guest panel about his work as an animator, he hosted a special panel to share his experiences as a Berryz Koubou fan with the convention attendees. In the interview with Mr. Yoshimatsu, we were able to learn more his 33 years of experience as an animator, his passions, and his travels. Included below is the interview, translated into English. 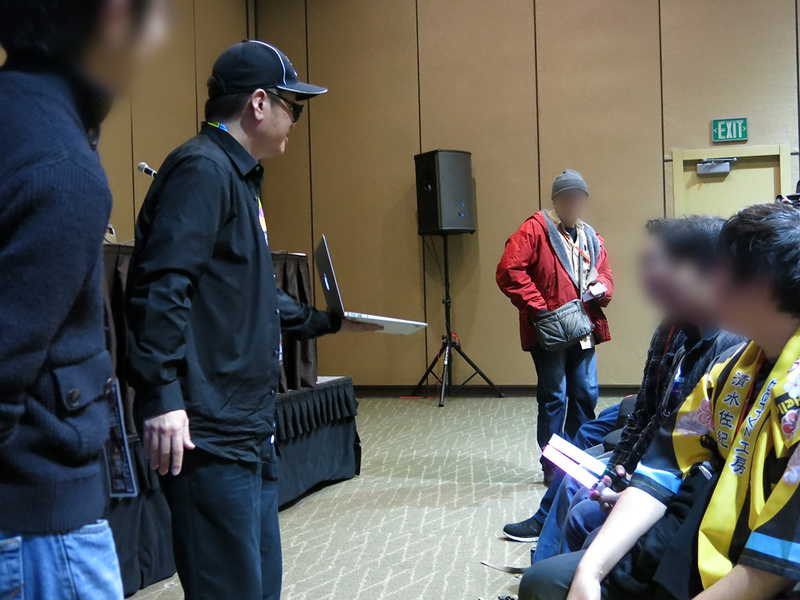 We would like to thank Mr. Yoshimatsu for taking the time and effort to answer our questions, and to Sakura-Con for providing the opportunity to meet such a talented person. ―― Why did you decide to enter the animation industry? This is probably the same for many others, but I loved watching anime. I wanted to try my hand at producing animation so I searched for a company that I liked and applied there. ―― Is there anyone in particular you look up to in the animation industry? I really admire the late founder of the studio I work at, Toyoo Ashida (芦田豊雄). I decided to work at that studio because of him. ―― What was it like working on Mashin Eiyuuden Wataru (魔神英雄伝ワタル)? At that time I was still just starting out in the industry, but I especially treasure my memories of working on the key animation and helping with the sub-character designs. ―― You also worked on key animation for Crystal Triangle (禁断の黙示録クリスタル・トライアングル) in 1987. How has your work as a key animator changed since then? I was still quite inexperienced then. As I have gained more experience, I've improved on my shortcomings as a young animator and believe that I am much more efficient at my work now. ―― How is the modern digital animation process different from the cel animation process you used when you started? When digitization began there was resistance to the change, especially with respect to the direction to differ from the "cel look". However, now there is no limit to the things animators can express. We have also been able to improve our animation quality because the process is more efficient, so digitization has helped us animators a lot. ―― Of the shows you have worked on, which has left you with the strongest memories? The best reception I got was for Future GPX Cyber Formula (新世紀GPXサイバーフォーミュラ). Out of all of my works, the most people enjoyed it. ―― What was it like working on Nyanpire (にゃんぱいあ) versus a work like Trigun? The art styles are completely different. It's a lot of fun drawing different art styles, including both serious and cute ones. Nyanpire's style is easier to draw. I'd like to do more. At the round-table press interview. ―― You did the character designs for Supernatural the Animation. What was it like making an American drama into a Japanese anime? Personally, I really like watching foreign dramas like Breaking Bad. The chance to turn a foreign drama into a Japanese anime is quite rare, so that project was a lot of fun. Instead of the usual style of drawing shadows, we made them completely black. I think we were able to do something interesting with the art. ―― So really like watching western dramas. Something that's a big point of contention in the anime fan world is subtitles versus dubs. When you watch these dramas, do you prefer subtitles or dubs? When I have time I like to watch it with Japanese subtitles. When I'm busy though, I watch while I work, so because I can't quite read all the subtitles I watch it with a Japanese dub. ―― Do you think that the dub changes your interpretation of the drama? The voices in the Japanese dub of Columbo are completely changed from the English voices, in particular the voice of Peter Falk. ―― Is this your first time in Seattle? It's actually my third time. ―― Is there anywhere in particular in Seattle you would like to to visit? Hmm... I've been to a lot of places already, so I guess this time around I would like to see nature a bit more. I've been to Bruce Lee's grave twice already, actually. ―― So, you're a martial arts fan as well? Recently I've been watching a lot of UFC matches. People in Japan have been pretty into the Pride Fighting Championships. I watched it quite often on TV. ―― I heard that your favorite idol is Fujimoto "Mikitty" Miki from Hello! Project, but who are your top three Hello! Project idols? Mikitty (ミキティ), um, Akari Uemura (植村あかり)... This is tough. Hmmm... Ai Takahashi (高橋愛), I suppose. ―― Then I assume you're not DD? ―― Do you like all the groups and girls in Hello! Project? Pretty much, but right now I like the group Juice=Juice best. ―― How did you get into Hello! Project? Before idols, I was a big fan of pro-wrestling. I suppose it was after going to see Hulk Hogan and The Rock's match at the annual Wrestle Mania event. The match was so absolutely amazing that I felt after that match, my love for pro-wrestling had left me. My feelings for pro-wrestling had peaked, and I couldn't imagine anything after that match being better. After that, I didn't have anything to pour my feelings into. ―― So you've been to the US and Canada very often? Yeah, I've been often to go see wrestling matches and WWE matches. I haven't attended one recently though. I think the last time was 2011? I went to Orlando. After I returned to Japan, I went to a Hello! Project concert. Beside me was a young American guy, and when I told him that last month I was in Orlando, he told me that he lives there. Otaku exist all over the world, don't they. ―― Do you watch both American and Japanese wrestling? ―― Who is your favorite WWE wrestler? Well, if it's my favorite wrestlers of all time, I really like Stone Cold Steve Austin and The Rock. When I visited New York, there was a T-shirt store in Chinatown that had lots of WWE t-shirts. I saw so many that I wanted, I ended up buying a mountain of them. Years later when I went back, the owner said "Oh! You again!". ―― Idol anime has been very popular recently. If you had an opportunity, what kind of idol anime character would you like to design? A character similar to Mikitty? I've actually done that before. I designed an idol character which looked like Mikitty for the anime Oh! Edo Rocket (大江戸ロケット). It seemed like there would be no problems with it so at first the character was really similar to her. However when I asked the director, Seiji Mizushima (水島政治), about the rest of the story for the anime I learned that the character would be in a pretty racy scene, so I redid her design to be less similar. I can't have a character so similar to Mikitty being in such a scene! ―― As an animator and a fan of idols, what do you think of animated idols and 2D idols? I think it's great that everyone supports something they like. (laughs) Everyone should have fun and enjoy it. (laughs) I can't watch everything and follow all the groups, so I stick to being a fan of Hello! Project idols. ―― So you watch 2D idol anime? ―― Did you also have any interest in 80's idols like Onyanko Club (おニャン子クラブ)? Back then I didn't have too much of an interest in idols, and never thought that when I got to this age I'd start to like idols, so it's pretty surprising even for me. I did listen to the Onyanko Club sub-unit Ushiroyubi Sasaregumi's (うしろゆびさされ組) CD often though, since it was the opening theme for an anime I worked on called Highschool! Kinengumi (ハイスクール！奇面組). ―― What sort of music were you interested in then? I've been a fan of KISS since the 70's. (laughs). I went to see a concert of theirs in Tampa Bay. ―― I haven't seen a KISS concert, but I did see some of their members at Anime Expo last year with Momoiro Clover Z (ももいろクローバーZ). I'm jealous! (laughs). KISS and Momoclo did work together, didn't they. I remember being envious of the Momoclo members. (laughs). I haven't been to one of their concerts since they became Momoiro Clover Z, but I did see them when they were still Momoiro Clover. 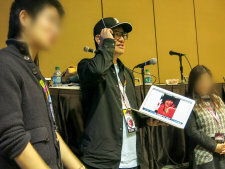 There were some high-level fans at his panel. ―― So you're doing a panel on Berryz Koubou (Berryz工房) later. Why do you like them the most out of Hello! Project? I like that they're always playful and fooling around. ―― Berryz Koubou actually came to Sakura-Con for a concert before. The Japanese fans came and danced the chereography to all of their songs in the aisles. Oh, wonderful! (laughs) I wanted to go. I can dance to all the Berryz songs too. I was a guest here at Sakura-Con the year before they were guests. I was just a year early... I saw them going around Seattle on TV and was so frustrated. I kept saying things like, "I know that place!". ―― Was that a report on a news program or a special Hello! Project news program? It was Hello! Project's TV show where they talk about recent events. I really love Chinami (徳永千奈美), and there she was on TV walking around Seattle, so I'd yell stuff like "Chinami! If you go over that way theres an American comic store!" (laughs). ―― It sounds like you've explored Seattle quite a bit. I really love Seattle. When I was invited to Sakura-Con this year, I accepted right away. I'd be able to eat delicious seafood again! Also, you know where they throw the fish around in Pike Place Market? When I went there in my WWE jacket, the shop staff asked me if I was a wrestling fan, and when I told him I was, he started to play-wrestle with me right in front of the store. It's a really great memory of Seattle for me! I've got to go back for a rematch! (laughs). ―― Is there a country you haven't visited that you would like to? Either as a guest for an event, or even just a vacation, maybe? I want to visit Europe more. I've only been to Germany so far. ―― Do you visit other countries in Asia or southeast Asia or Oceania very often? Just recently I went to Thailand for a Berryz Koubou concert. (laughs). ―― How do you feel your personal interests influenced your work? It's helped me store up inspiration for when I create characters. If I don't have various points of inspiration in my head to use from, ideas won't come to me. If I don't experience different things from different places, I wont' have the parts in my head to draw on when I need an idea. I guess lining up for handshakes with idols isn't really a necessary thing for my inspiration though. ―― When did you realize that you had fans of your work overseas? The first time I was invited overseas was to Anime Expo right after I had worked on Trigun. I saw a lot of people cosplaying characters myself and the other staff had worked on, and was happily surprised. I especially thought that the number of Vash the Stampede cosplayers was amazing. ―― What do you think of overseas events? Do you enjoy them? Being able to directly see fans of my work enjoying themselves after working so hard is very rewarding and encourages me to continue working hard. ―― Do you attend anime events in Japan? I go to Comic Market every year. I also went to Tokyo Anime Festival when it was still around. There are lots of cosplayers at Comiket, so it's very interesting for me. Recently, the number of cosplayers from overseas at that event has been increasing. ―― How do the cosplayers overseas compare to the ones in Japan? There are a lot of anime characters that are very cool, and I think American cosplayers suit those types of characters more than Japanese cosplayers. Of course, there are also characters that are more suited for Japanese people. I think that gap between countries is quite intriguing. I do feel that blonde cosplayers really do suit cool characters like Vash though! He showed photos of his idol goods and memorabilia. 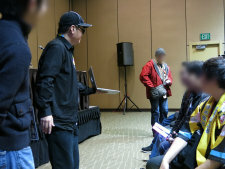 ―― Was your involvement in Comiket as a circle, was it with the industry booths, or do you just go as a normal attendee? Every year I do my best to release my own book at Comiket, but unfortunately I forgot to apply for the next one this summer. ―― As someone who is in the industry, how much freedom do you have in your circle work? I do my best to release things that have no relation to my official work, like diary manga. It's not like I'm publishing original key animation art books or anything. I'm publish these unofficially though. (laughs). ―― Did you want to be an animator since you were a child, or did you imagine something completely different? When I was a child I wanted to be a manga artist. In school I was always the best in my grade at drawing manga, but when I found out that there was someone better than me at another school, I was shocked and stopped drawing manga. That person was Takashi Shiina (椎名高志), the creator of Ghost Sweeper Mikami (GS美神 極楽大作戦!!). At first I didn't realize that he was the artist of Mikami. I was a fan of the manga for a long time. One day when reading it I thought maybe that it was him drawing it, so I sent in a fan letter. In response I got a phone call from him saying "Yeah, it's me." (laughs). He told me that his editor was a big fan of Cyber Formula, an interesting coincidence! ―― On that topic, what is your favorite anime, and what anime and manga did you really enjoy when you were little? ―― Is there a certain anime you're really interested in right now? Osomatsu-san (おそ松さん). Because I'm Yoshimatsu-san. ―― The industry has changed quite a bit now. If you had a chance to, what kind of show would you like to work on? Something interesting, funny, and that doesn't hurt my shoulders to draw. I want to work on it at a relaxing pace. Something like Nyanpire 2, I guess. (laughs). ―― How would you describe yourself in one word? ―― Do you have any adivce for those trying to join the anime industry? I'd say the most important thing is to love drawing. Speed is really important in this industry, so I'd say that being able to draw a lot quickly is a good skill. I think it's also a plus to have an interest in many different things. Besides anime. Stuff like pro-wrestling, KISS, and idols. (laughs).